NEW ORLEANS – All-America honors for the 2018 NCAA Division II Outdoor Track & Field season were announced Tuesday by the U.S. Track & Field and Cross Country Coaches Association (USTFCCCA). Student-athletes earned First-Team USTFCCCA All-America status by virtue of finishing among the top-8 in their events – including as a member of a relay team – at this past weekend’s NCAA Division II Outdoor Track & Field Championships in Charlotte, North Carolina. Second-team honors were bestowed upon those finishing ninth through 12th. Ninth- and 10th-place relay teams also earn the distinction. A total of 260 men claimed 311 All-America honors (217 First Team, 94 Second Team) from 89 different institutions. Saint Augustine’s led the way with 14 All-America selections, while the national champion Texas A&M-Kingsville Javelina had 13. Two men garnered four All-America honors apiece. 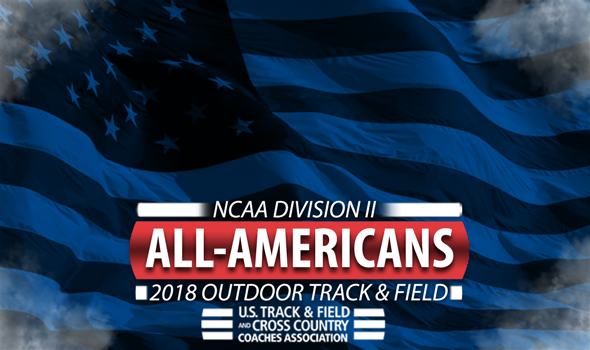 Ashland’s Myles Pringle was named a First-Team All-American in the 200, 400, High Jump and 4×400 relay while Saint Augustine’s Brandon Valentine-Parris picked up four honors in the 200, 400, 4×100 relay and 4×400 relay. On the women’s side, 234 different women earned 309 All-America honors (220 First Team, 89 Second Team) from 89 different institutions. Grand Valley State had 20 All-America honors to its name, followed by 16 by the national champion Lincoln (Mo.) Blue Tigers. Saint Augustine’s Shannon Kalawan was the lone woman with four All-America honors, picking them up in the 400, 400 hurdles, 4×100 relay and 4×400 relay. See below for a full list of those athletes who were named NCAA Division II All-Americans by the USTFCCCA.